I normally don't post this late in the day, but I was holding out hope that the sun would make an appearance so that I could take pictures of this polish in the sunlight. But alas, Mother Nature didn't cooperate. Though, I think I captured this color pretty well in spite of that. OPI Just Spotted the Lizard is from the summer Spiderman Collection and really stands out for two reasons. One: It was the only color that screamed "different" to me. I'm not a huge fan of crackles/shatters/etc, so it wasn't exactly my cup of tea from the start. And I could really live without the other shades. 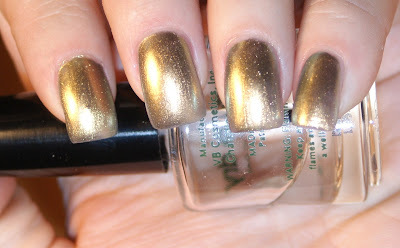 Two: It's a dupe for Chanel Peridot, which always appealed to me, but came with a heck of a price tag. 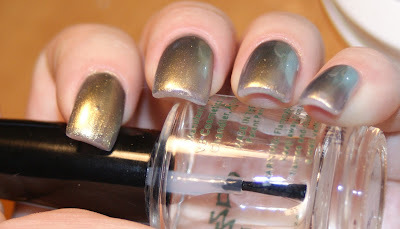 Just Spotted the Lizard is a metallic duochrome polish that shifts between pale gold, to mossy olive, to straw. Overall, I really liked the application of the polish. Normally, I'm not a fan of these kind of metallics because they leave too many brushstrokes, but they really weren't too bad. It's barely noticeable. It actually sort of has a brushed gold look to it. The entire Spiderman Collection is available at your local Ulta and JC Penney and the suggested retail price is $8.50 a bottle. So what do you think of Just Spotted the Lizard? Is it a keeper?